We don’t know about you, but we want skincare that works. Oh wait, that’s everybody isn’t it? That explains how we’re always looking for the holy grail product, reading endless reviews, and okay, sometimes shamelessly asking for samples at beauty counters. The thing is, if it works for other people, why isn’t it working for you? Well, it’s all in your head. No, really, we mean that. Today’s skincare research is as advanced as it gets, and for a beauty brand like Shiseido, they’re always ahead of the curve in groundbreaking science — this time, they’ve focused on how good skincare goes beyond just physical skin cells, and instead, has to do with how our brain perceives what we’re feeling on our skin. 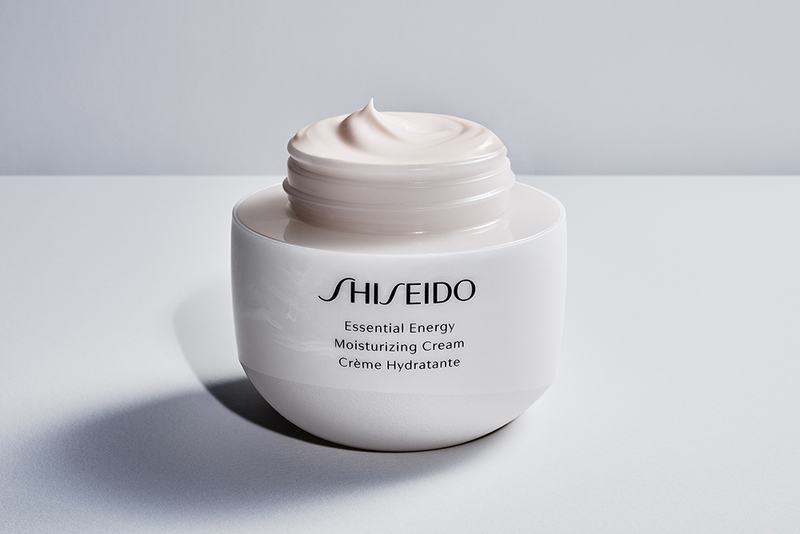 On a trip to Tokyo last year, to the heart of Shiseido’s headquarters, we were the first to hear what the top directors, people involved in creating the line, had to say about the Essential Energy launch and their radical scientific findings. “Normally, for dark spots and wrinkles, we look at what’s happening, and believe that the cause is in the skin. This time, we’re not looking at something in the skin, but something in the mind, and how information is transmitted. That’s a big breakthrough in the cosmetics industry,” says Mr Toshihito Yabu, Director of Shiseido’s Advanced Research Center. This then leads us to the tagline for their new Essential Energy skincare range, “inspired by neuroscience” — but what does that mean, and why is what’s going on in our head so important? Why is neuroscience so important to skincare? The beauty brand’s research arm has been working together with Massachusetts General Hospital and the Harvard Cutaneous Biology Research Center in order to better understand neuroscience, and has since discovered that nerve cells, which transmit messages between your mind and body, ultimately affect your skin. According to the scientists, they’ve noticed that the turning point comes when you’re in your 30s, when your skin can’t recover as quickly as it used to, whether your skincare routine or lifestyle remains the same or not. You may feel that despite trying more expensive products or top-notch facials, the results are pretty average, nothing amazing or life-changing at best. Yep, your skincare seems less effective once you hit your 30s! That’s definitely a concern — and a growing one, so don’t worry, you’re not in this alone. One key explanation is that your skin may not be as responsive; anything that your skin feels isn’t as well-transmitted to the brain, so it doesn’t respond as quickly, or as effectively. While Shiseido’s earlier existing line, Ultimune, works to boost skin’s immunity and how it naturally defends itself from external aggressors, Essential Energy has more to do with how our skin is able to regenerate itself after damage occurs. The best condition is when “skin detects damage as soon as possible” and responds accordingly to its needs. 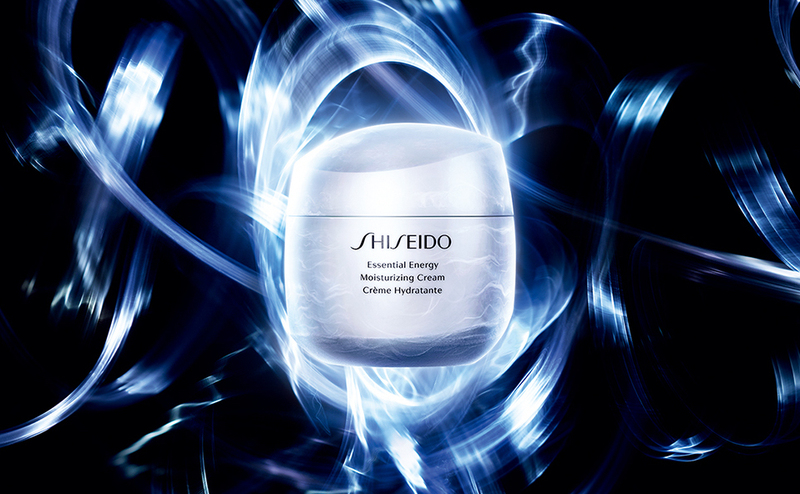 The new Essential Energy line, therefore, is the ideal defense Shiseido came up with, and helps our skin to respond better to skincare. The key concept to understand here is ReNeura Technology™, which works on our skin’s sensors, enabling them to be more responsive to skincare. There are two approaches to this — first, they’re improving the way the product is applied, in order to trigger a response; and second, they’re boosting the power of our nerve cells, so they’re better able to transmit signals between our skin and the brain. These are applied across all three moisturisers that currently exists within the skincare line. Simply put, it’s a flexible ball-shaped powder that compresses under your fingers. As you apply the creams, usually in circular motions on your face, the powder flexes, bends, and rolls around, and compared to a more rigid component, your skin is better able to detect the motion of your hand — that particular sensation is especially important for less youthful skin. “When pressed into the skin, the ball will change its shape according to pressure applied from different directions — this trains the skin to respond. In a way, it’s like massaging the skin, but more effective,” says Mr Kiyoshi Sato, Center Director of Shiseido’s Advanced Research Center. The Ashitaba plant is a wonder in itself — when translated from Japanese, its name means “tomorrow leaf”, based on the hopeful premise that when you pick one of its leaves, a new leaf re-sprouts the next day to takes its place. 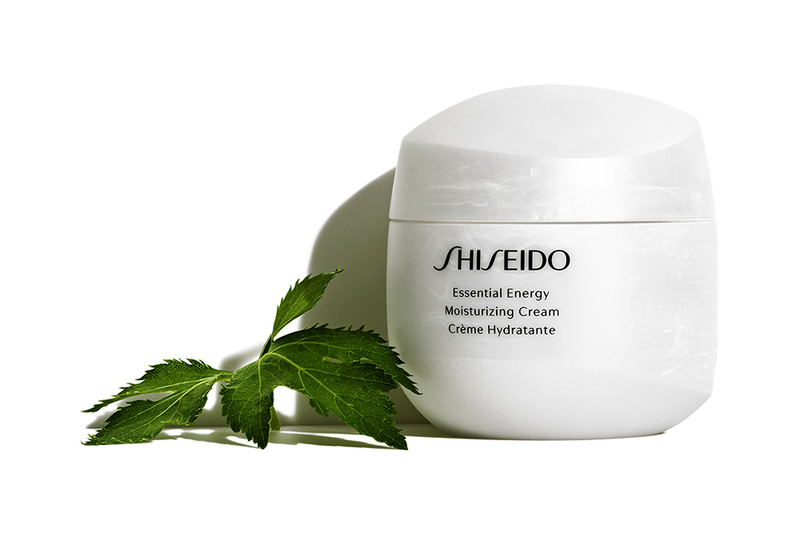 Shiseido has tapped into the powder of this Japanese medicinal herb, and uses it to protect against skin damage. You see, UV rays or pollutants damage the skin, but you already know that — they also affect our nerve cells’ mitochondria, which will then be unable to generate enough energy to transmit signals in the nervous system; our skin can’t respond as well. The new compound, Ashitaba α, however, helps suppress its damage, enabling our skin to be more responsive, and better able to counter and repair skin damage. What you’ll then notice is an improvement in dullness, roughness, or the appearance of fine lines, or, brighter, smoother and more youthful skin. 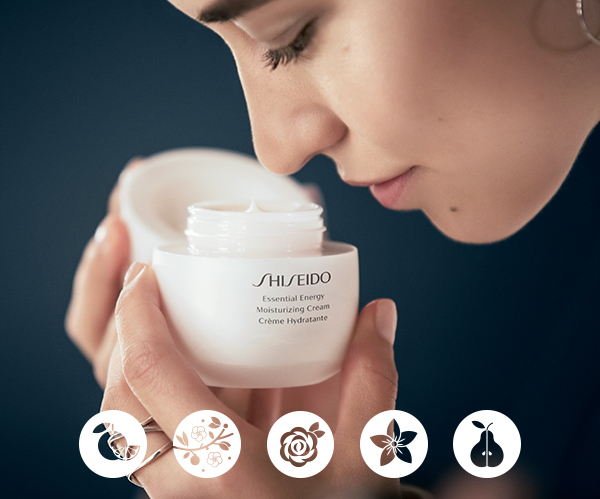 Since we’re talking about the way our skin perceives good skincare, Shiseido ensures that everything surrounding their Essential Energy products adds to this wholesome experience too. Just think back to the last time you opened a jar and smeared its contents on your face. A little unromantic, isn’t it? Maybe even clinical, borne out of necessity. Well, that relationship is about to change. You’re going to love your skincare routine, thanks to these three components — and we’d even argue that they’re as important as the quality science that goes into the skincare formulas. We all can’t resist a good scent, and a great one puts you in the right mood for the rest of the day. For Essential Energy, they’re relying on a pleasant fruity-floral concoction, with hints of rose and jasmine, as well as accents of fresh pear, sweet Ume plum and a base of musky wood. What truly stands out is the touch of sweet orange — this awakens the senses, and even helps to decrease stress with each uplifting whiff. Shiseido’s researchers found that in order to feel that our moisturisers are working, we need two distinct sensations — a smooth, lightly-whipped quality, and that the formula is able to sink deep into the skin, which is exactly what they worked on. You’ll find an exclusive moisture-locking oil across the moisturisers; this fits closely to our skin, and spreads smoothly and quickly without an uncomfortable stickiness. Honestly, this was what got us the most excited at the launch. We were made to enter a pitch-black room, only to witness this mesmerising display of 64 bottles of the Essential Energy Moisturizing Cream, blinking like stars in the night sky. All of that, to highlight how the Essential Energy range sees a series of 64 unique bottle shapes. Pretty impressive huh! You’ll also find that the bottles stand out against the usually glass or metallic packaging for luxury cosmetics — and that’s a deliberate choice. Shiseido’s version of prestige feels more organic, and is inspired by Japanese tea ceremonies and the way each handcrafted tea bowl is designed to fit naturally in your hands. The fine craft of that is then translated to the bottles, each with a subtle marble effect that adds to the ethereal, tactile experience. As for the various bottle shapes, it boils down to personal experience. “Every time a customer buys a bottle, we want them to feel a different experience,” says Mr Mao Komai, Shiseido’s Art Director. When you hold them, you do feel the difference; they’re light and delicate — special, just like how your skincare should be. Read our review of the skincare line here. For a limited time only, you’ll be able to get launch-exclusive sets at lazada.sg! This includes the Essential Energy Day Emulsion Set that’s going for $80 (worth $194) that comes with the full-sized version of the Essential Energy Day Emulsion, as well as the Ultimune Power Infusing Concentrate (15ml), Ultimune Eye Power Infusing Eye Concentrate (5ml), Shiseido Instant Eye and Lip Makeup Remover (30ml) and an Ever Bloom Eau de Parfum (10ml). There’s also the Essential Energy Moisturizing Cream Set (worth $201) and Essential Energy Moisturizing Gel Cream Set (worth $194), all at $80.